Held Us Build An Oyster Reef In The Severn River! We are drawn to its shorelines … We find enjoyment in boating, fishing and exploring its waters. We are homeowners, business owners and citizen leaders. We all rely on the opportunities and the sense of community it provides. We depend on the Severn River, and now the Severn River needs our help. This July, with your support and the generosity of the surrounding communities, let’s raise $50,000 to plant 10 million water-filtering oysters in the Severn River. Every donation to Operation Build-A-Reef, no matter the size, directly supports the production, transport and planting of baby oysters in the river. To reach the 10-million oyster goal, please considering purchasing a bushel of spat-on-shell for $100. Each bushel contains thousands of baby oysters. The Severn watershed drains a large, densely-populated area. As a result, our communities experience erosion, degraded water quality and other pressing issues. Anne Arundel County is working hard on land-based clean-up efforts. Your sponsorship enables the plating of water-filtering oysters to help repair the river from within. Operation Build-A-Reef expands upon significant progress made during the summer of 2018, when over 47 million oysters were planted on protected oyster sanctuaries between the Severn River and U.S. Naval Academy bridges. 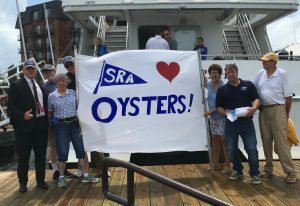 It is a collaborative partnership between the Severn River Association and the Oyster Recovery Partnership. As friends and neighbors, businesses and community organizations, let’s do more than imagine a health Severn River… let’s make it happen! Donate here — and please share information about Operation Build-A-Reef with your network! For thousands of years, oysters thrived in the Severn. They had a strong effect on the nature of the river itself, creating fisheries and influencing human life along these shores. Fast forward to today – over harvesting, pollution, stormwater runoff, dead zones, diseases, algae blooms and increased sediment from development virtually eliminated our once thriving oyster reefs. Fortunately the Maryland Department of Natural Resources and others have stepped start restoring our historic oyster reefs, but we need to keep pushing ahead. That’s why the Severn River Association and the Oyster Recovery Partnership created Operation Build-A-Reef. The program solicits private donations to purchase millions of oyster spat and plant them in the Severn River to repopulate and restore historic oyster reefs. Because each oyster is small water-treatment plant. A mature oyster can filter up to 50 gallons of water per day! And, oyster reefs create the structure and habitat for other marine life to thrive, and improve fishing on the river. 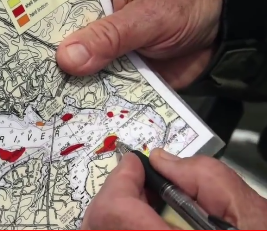 The red areas that SRA board member John Page Williams is pointing to at right are the historic oyster reefs that Operation Build-A-Reef is repopulating with baby oysters. 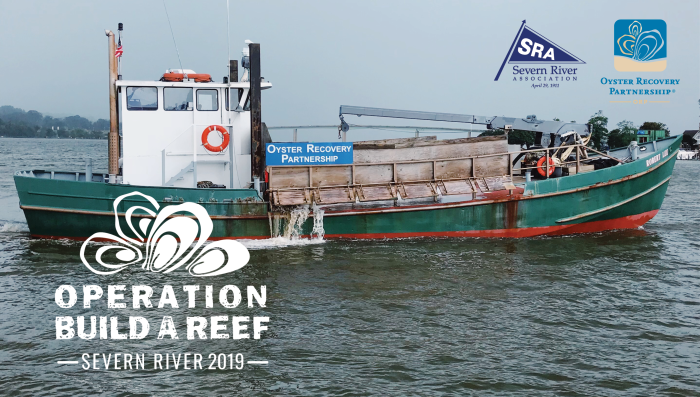 In 2018 when the SRA/ORP partnership launched Operation Build-A-Reef debuted, we leveraged support from the Maryland Department of Natural Resources with private donations to purchase 47 million oyster spat-on-shell from the Horn Point Hatchery in Cambridge, Md. The Robert Lee at work on the Severn River. 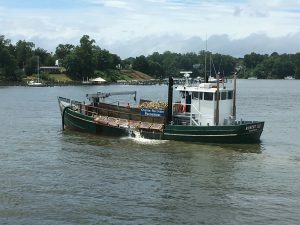 The spat were shipped up to the Severn River on the oyster planting vessel, the Robert Lee, which planted the spat-on-shell in four trips to the Severn River. To the left is the the Robert Lee in action planting oyster spat-on-shell on the first of four planting days in July 2018. The Capital newspaper provided excellent coverage of the first day of planting. Click here to read the article, watch their video and check out some pictures of the July 23, 2018 event. The oyster reefs selected for restoration were chosen because the have firm substrate on the river bottom that oysters can easily attach to and get to work cleaning the river. Plans are already underway to plant millions more oyster spat-on-shell in the summer of 2019. Annapolis Mayor Gavin Buckley (left in dark blue) joins SRA President Lynne Rockenbauch (in light blue) at Build-A-Reef planting celebration. SRA Oyster Chair Bob Whitcomb in yellow cap. SRA will continually monitor water quality in these areas in 2019 to track how well the oysters are doing. Ultimately, it will take billions of oysters to filter the entire river – from the mouth to the headwaters. As we lauch Operation Build-A-Reef in 2019, we taking another giant step to recreating and repopulating our historic oyster reefs. Severn River Association, Oyster Recovery Partnership, Maryland Department of Natural Resources and the University of Maryland’s Horn Point Hatchery. 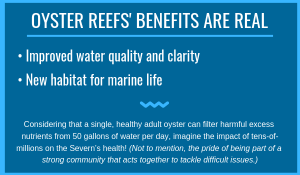 Improve water quality to create a resilient reef habitat by planting and monitoring oysters that will perform their natural, historic function – to filter the water.